Versamark Dazzle Ink Pads in Frost & Champagne. (Can't wait to play with this ink!) VersaMark™ Dazzle combines all the great qualities of the original VersaMark™ with added shimmer to give your paper projects an easy touch of elegance. * Perfect for a myriad of techniques including monochromatic and watermark effects. * Ideal for embossing and providing a base for chalks and pigment powders. 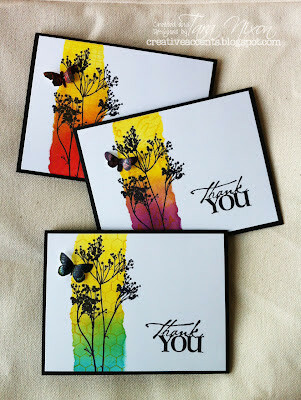 * Heat-set on glossy papers and brayer over with Memento™ dye inks for a shimmering resist effect. * Use on dark papers for subtle sparkling images. * Excellent for background designs and patterns. * Water-based, archival and acid-free. Several new Nestabilities & Shapeabilities dies- nested bird, Labels 2, Curved Rectangle, Large Pinking Circles and Large Labels. Assorted Disney dimensional stickers- princesses, Mickey Mouse, Wall-E & Hannah Montana. Plus, our Christmas card contest is open for voting! We got a great assortment of cards this year (including 7 kids card entries! ), so there's sure to be something to inspire you! Stop by and place your vote today!